BOOKING AN APPOINTMENT: We recommend scheduling your appointment 1 week in advance however this is not necessary. To accommodate Packages or a Group Party we recommend at least 1 to 2 weeks in advance to provide our staff ample time for planning your perfect day. SPA HOURS: 9:00 AM to 7:00 PM, Tuesday thru Saturday. After hours appointments available by special request. Sunday , Monday and After hour rates may vary. GIFT CARDS: Gift cards are available for purchase. Lost cards are NOT replaceable or refundable. GIFT CERTIFICATES: Gift certificates are available for purchase over the phone, online or in person. We will gladly mail your gift certificate any where for you. All gift certificates including lost, e-mailed, mailed and phone ordered are NOT replaceable or refundable. You may add the 20% standard gratuity to your order. Click here to place your order now, or simply call 727-726-5422 and request your gift certificate to be processed by phone and we will gladly mail or e-mail your gift certificate for you. All sales on Gift Certificates are final and not refundable. CHECK IN: Please check in 15 minutes prior to your appointment, at this time you should present any gift card(s) that you wish to use towards your services. Then you can sit back in our relaxing waiting room with one of our complimentary drinks. This will allow you time to fill out any necessary paperwork before your services are scheduled to begin. We regret that we cannot be responsible for personal articles. Please leave all valuables at home. FOR YOUR CONVENIENCE: We offer lockers, robes and slippers. AGE REQUIREMENT: We love children, but the spa is not a playground for them. We would like the spa to be relaxing for all clients. CELL PHONES AND PAGERS: Please remember to turn off all Cell Phones and pagers to ensure a peaceful experience for everyone. SUGGESTIONS PRIOR TO SPA SERVICES: We strongly recommend you drink plenty of water before and after your spa visit. If you have any medical conditions, please advise your therapist/specialist. PAYMENTS: We accept Visa, MasterCard, and American Express. We do not accept checks. PACKAGES: We do not allow substitutions or sharing of packages. PACKAGES, MULTIPLE SERVICES AND GROUP PARTY: If you wish to book one of our packages, multiple services, or a group party a credit card will be required to guarantee your appointment. To avoid charges in full for services you reserved, you must contact us 72 hours in advance for any cancellations or rescheduling. CANCELLATION POLICY: Because our spa has reserved an appointment for you, we ask that you please notify us 24 hours prior to any cancellations on a Single Service to avoid a charge to your credit card. We will be more than happy to reschedule any appointments for you. Pre-Paid Policy: We understand some clients are traveling from out of town for vacation as well as locally making plans in advance. Unlike our competitors, Bella Michelle Day Spa DOES NOT DOUBLE BOOK! Bella Michelle Day Spa offers pre-paid options for your convenience to guarantee your treatment time is fully reserved for you upon your arrival. 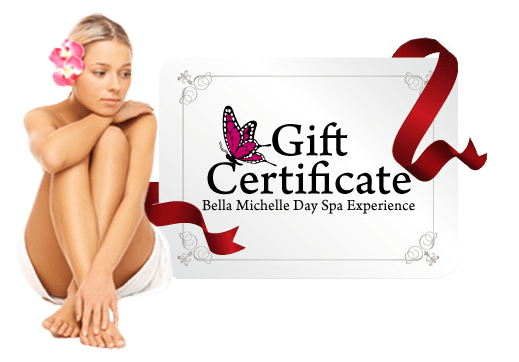 If necessary you may reschedule and your pre-paid option will be in a gift certificate form e-mailed to you to ensure your proof of purchase with Bella Michelle Day Spa. REFUND POLICY: All sales are final and non-refundable. You may reschedule an appointment, or receive a Bella Michelle Day Spa gift certificate of equal value for your pre-paid appointment. Get a Bella Michelle Day Spa Gift Certificate for that special someone! Bella Michelle Day Spa will mail your gift certificate anywhere you choose! Design your gift certificate, preview it, and then send or print it immediately. It’s fast and easy! At Bella Michelle Day Spa we pamper, comfort, beautify, & strengthen you so you can experience relief from the daily stress of life & encounter physical & mental renewal. We Treat Everybody Special! 2454 N. McMullen Booth Rd.